Explanation: What is that green thing? A volunteer sky enthusiast surfing through online Galaxy Zoo images has discovered something really strange. The mystery object is unusually green, not of any clear galaxy type, and situated below relatively normal looking spiral galaxy IC 2497. Dutch schoolteacher Hanny van Arkel, discovered the strange green "voorwerp" (Dutch for "object") last year. The Galaxy Zoo project encourages sky enthusiasts to browse through SDSS images and classify galaxy types. 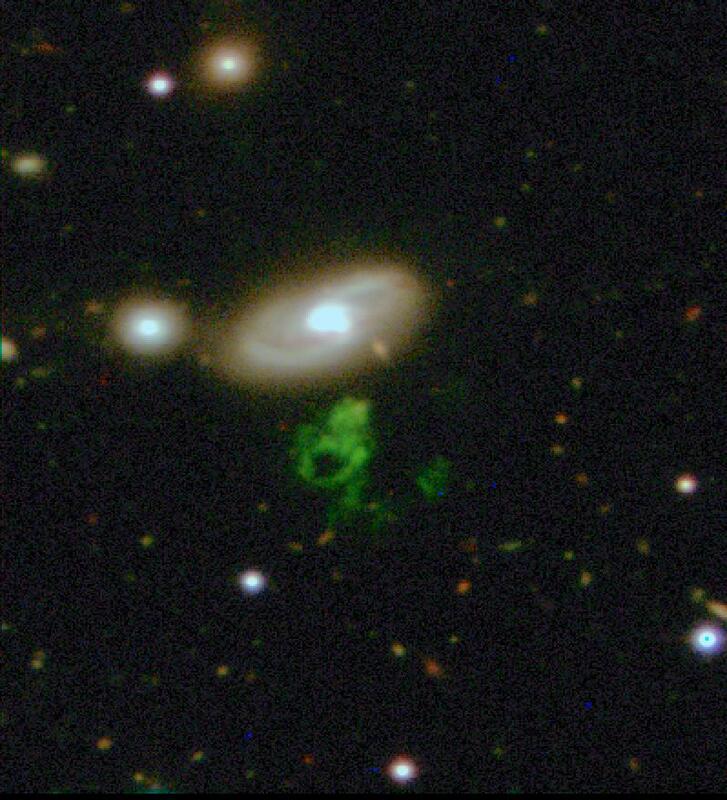 Now known popularly as Hanny's Voorwerp, subsequent observations have shown that the mysterious green blob has the same distance as neighboring galaxy IC 2497. Research is ongoing, but one leading hypothesis holds that Hanny's Voorwerp is a small galaxy that acts like a large reflection nebula, showing the reflected light of a bright quasar event that was visible in the center of IC 2497 about 100,000 years ago. Pictured above, Hanny's Voorwerp was imaged recently by the 4.2-meter William Herschel Telescope in the Canary Islands by Matt Jarvis, Kevin Schawinski, and William Keel.